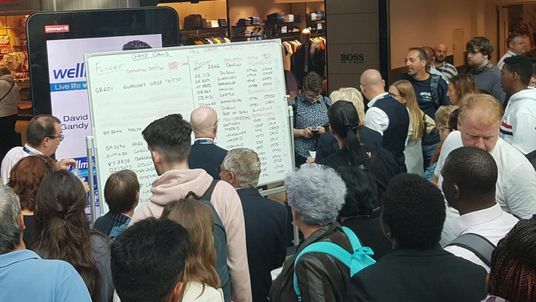 Staff at Gatwick Airport have had to write information about flight departures on whiteboards after a technical issue means screens have failed. Staff could also be seen rubbing out information as it changed to update it with black and red marker pens. Gatwick Airport tweeted: "We are sorry, but due to an IT issue our flight information is not displaying correctly. Please use the temporary flight boards in the departure lounges or listen for airline flight announcements. "We are expecting to resolve the issue soon and apologise for the inconvenience." There was frustration among some passengers who described walking to wrong gates or having their flights delayed. A Gatwick spokesperson said a "handful of people had missed their flights" as a result of the problem. A user by the name of @helenwalsh tweeted: "Absolute carnage @Gatwick_Airport with no boards working and no staff with gate info."